You can prevent correctly positioned layers from being selected in the Camera view by locking them in the Timeline view. This is useful for making a multiple selection inside the Camera view while avoiding to select them. Once a layer has been locked, its locked state will be remembered the next time you open a saved project. • The Lock option lets you lock one or a multiple selection of layers. • The Unlock button lets you unlock one or a multiple selection of locked layers. • The Lock All option lets you lock all the layers in the Timeline view. • The Unlock All button lets you unlock all the layers in the Timeline view. • The Lock All Others button lets you lock every layer except the selected ones. In the Timeline view, select one or more layers. ‣ From the top menu, select Animation > Lock > Lock. ‣ Click one of the selected layer’s Lock icon. ‣ Press Ctrl + Alt + L (Windows/Linux) or ⌘ + Alt + L (Mac OS X). 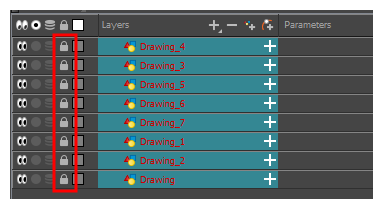 All selected layers are locked. In the Timeline view, select one or more locked layers. ‣ From the top menu, select Animation > Lock > Unlock. ‣ Click a selected layer’s Lock icon. ‣ Press Ctrl + Shift + K (Windows/Linux) or ⌘ + Shift + K (Mac OS X). All selected layers are unlocked. ‣ From the top menu, select Animation > Lock > Lock All. 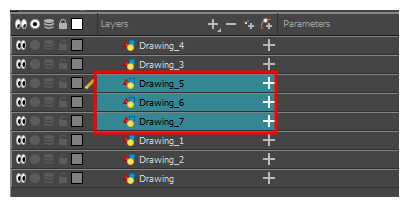 ‣ In the Timeline view, select all layers and click Lock icon of a selected layer. ‣ Press Ctrl + Shift + L (Windows/Linux) or ⌘ + Shift + L (Mac OS X). ‣ From the top menu, select Animation > Lock > Unlock All. ‣ In the Timeline view, select all layers (locked) and click Lock icon of a selected layer. ‣ Press Ctrl + Alt + Shift + L (Windows/Linux) or ⌘ + Alt + Shift + L (Mac OS X). 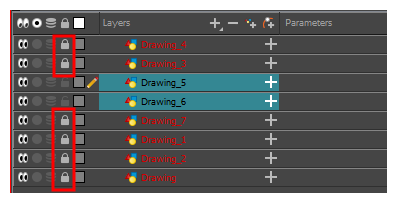 In the Timeline view, select the layers you do not want to lock. ‣ From the top menu, select Animation > Lock > Lock All Others. ‣ Press Ctrl + Alt + Shift + O (Windows/Linux) or ⌘ + Alt + Shift + O (Mac OS X). 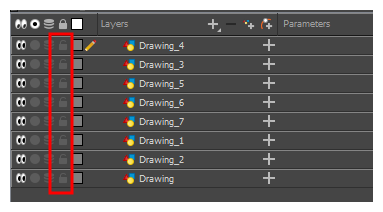 All layers are locked except the selected ones.